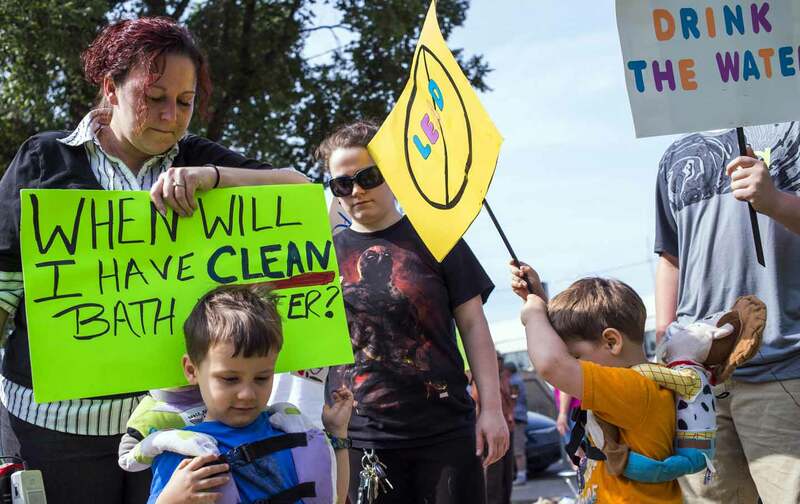 Dr. Philip Landrigan says we should not give up on the Michigan city's poisoned kids. We should give them support, resources, and early intervention services as soon as possible. When Bernie Sanders and Hillary Clinton faced off in Michigan last Sunday night, the nation’s eyes were once again on Flint, the majority-black city whose residents had been exposed for months to lead-laced tap water. The two candidates had both made Flint’s water crisis a crucial campaign cause, and the debate was a chance to showcase their outrage—both called for the resignation of Governor Rick Snyder—and perhaps win over a few Michigan voters before the Wednesday primary. But when resident LeeAnne Walters asked Clinton and Sanders whether they would remove lead service pipes from public water systems across the country, her question served as a sobering reminder that the threat goes well beyond Flint. The city’s toxic water crisis could happen again—and has happened before. In February, The Nation sat down with the doctor who is largely responsible for our present-day knowledge of lead’s extreme toxicity. Philip Landrigan, a distinguished pediatrician and epidemiologist at Mount Sinai Hospital, first noticed the effects of lead on children in the late 1960s, when he was a pediatric resident at Boston Children’s Hospital. Many children came in complaining of headaches and dizziness. Some were comatose. But it wasn’t until working on a case for the Center for Disease Control in El Paso, Texas—which was home, at the time, to a large smelting plant—that he correlated small amounts of lead exposure in children with a loss of IQ points. Landrigan’s studies in the early 1970s played a pivotal role in the government’s mandate to phase out lead in gasoline and to ban lead paint. In the past decade, an impressive series of studies building on Landrigan’s work have demonstrated that lead is toxic to children even at the lowest levels measurable in the bloodstream. Nonetheless, state officials ignored the findings of Dr. Mona Hanna-Attisha, a pediatrician at Hurley Children’s Hospital in Flint, when she alerted them that the proportion of children under 5 with elevated levels of lead in their blood had almost doubled since the switch to the Flint River. Landrigan spoke to The Nation about how far we’ve come in understanding lead’s toxicity and how far we have to go in protecting communities. Ava Kofman: When you published the results of your initial study, did people believe you? "As bad as Flint is, it’s hardly isolated. We still have a huge problem of lead poisoning in this country." Philip Landrigan: It depended on who you spoke to. People in the scientific community believed me. The lead industry rejected the findings out of hand, saying that they were foolish, that they were biased, and that they were the consequence of a whole series of other factors: socioeconomic status, race, inadequate parental education. They offered many different explanations to try to discount our findings. Another thing that the lead industry did was that they found paid experts to testify against us and write papers against us. AK: As someone who’s been working on this issue for decades, what was your initial reaction when you heard about Flint and the water poisoning there? PL: Well, I had a couple reactions. The first was this terrible sense of déjà vu, that it was “déjà vu all over again,” as somebody said a long time ago. [Laughs] The second was that it reminded me that as bad as Flint is, it’s hardly isolated. We still have a huge problem of lead poisoning in this country. The [Centers for Disease Control and Prevention’s] latest numbers indicate that more than 500,000 children [between the ages of 1 and 5] have elevated blood lead levels over today’s standards. There was a big survey of housing done a few years ago by a man named David Jacobs. It’s probably a little bit out of date, but not that much. He found that 38 million housing units in the United States contain lead, and in nearly two-thirds of those—so 24 million—the lead is in a deteriorating state, where it poses a hazard to children. So we still have a big problem. AK: When you first heard about the efforts of Dr. Mona Hanna-Attisha in Flint, Michigan, to study and distribute the results of her studies on the city’s mass lead poisoning, did you see a lot of parallels to your own work convincing authorities in Texas? PL: Oh, yeah, it was a clear parallel. I’ve never met her—we have corresponded by email in the past couple of weeks—but she seems like a very good and admirable person. She deserves full marks for her courage, for her persistence, for having skillfully brought the issue to the surface. AK: If you were to implement wider policy changes to make sure this doesn’t happen again, what would those be? PL: Well, the simplest thing would just be to have a national testing program to test the water. We have the technology to do it. And you don’t have to test every house in a big [water] system: You can just test systems. But you have to do the testing in the home, and the reason for that is most—Flint’s the exception—but most of the time lead in drinking water is not present at the source. In most systems, the lead gets in either from the pipes under the streets in some of the older cities in the country, or from the so-called service pipes that serve the homes that either are lead pipes or lead solder. AK: What can these children and families expect as they grow older and hit teen years and adulthood? PL: Unfortunately, lead causes brain injury. It can erode a child’s IQ. It can disrupt a child’s behavior. The good news is that the pediatric community, the community of child psychologists, and others who care about children’s development have developed some marvelous tools over the past 20 years for educational enrichment of children who have been damaged by lead or by other chemicals or by other problems beyond chemicals. And so I don’t think we should give up on these children at all. We shouldn’t throw up our hands and say that “these children are damaged for life.” That’s a terrible thing to do to these children. To say that “these kids are irretrievably damaged” sends totally the wrong message. But the message that does have to be put out is that, first of all, these children deserve proper neuropsychological evaluations, paid for by either the state or the federal government. It certainly should not come out of the pockets of the family. Secondly, if children are found to have problems, they should be provided with proper enrichment educational programs, and the sooner the better, because, as you might well imagine, the more quickly the intervention begins, the more effective it’s going to be. In other words, there’s inevitably going to be a lot of finger-pointing, a lot of people saying, “Who’s to blame?” It’s going to take time. Lawyers are going to get involved, courts are going to get involved, I understand all that. But somebody should have the courage to step in right quickly and say, “Let’s start the intervention programs for the children now, and we’ll find the money.” That’s what I would do if I were in the position to do it. But there is another issue, and that is that besides being able to cause brain injury in children, lead also can increase the risk for hypertension in adults, and for kidney injury, and the combination of hypertension and kidney injury has been well-documented to increase risk for heart disease and stroke. And around the world, lead is a major cause of heart disease and stroke as a consequence of hypertension. AK: Why is there such a difference in the physiology of children that causes lead to affect them more than the bodies of adults? PL: It’s all about human development. The human brain goes through this extraordinary development starting in about the fourth or fifth week of pregnancy, going through pregnancy and going through the first few years after birth…. The engineering is extraordinary! It makes the desktop computer look like a child’s toy. But the price of that incredible complexity is great vulnerability. So if anything—whether it’s lead or an organic phosphate pesticide, or the ethyl alcohol from a glass of wine—if any of those toxic chemicals get into the brain while that complicated development is going on, the damage can be very severe. Later on in life, at 5 years of age, or at 12 years of age, the brain architecture is more or less settled and it takes a lot more lead to cause harm. Lead is still toxic to the brain at any age, even as adults, but it takes a lot more lead as a person gets older. So that’s why the brain damage is the great risk at the front end of life. "People that studied the link between lead and IQ have found that American preschool-age children in the mid-’90s have IQs about 2 to 4 points higher than they would have in the mid-1970s." AK: How would you characterize the past several decades’ efforts to get lead out of the environment? PL: Overall, it’s been an incredible success story. When we took lead out of gasoline and paint starting in 1976, what we saw over the next decade was a more than a 90 percent reduction of the incidents of lead poisoning in blood levels. People that studied the link between lead and IQ have found that American preschool-age children in the mid-’90s have IQs about 2 to 4 points higher than they would have in the mid-1970s. AK: What do you think of the broader regulatory frameworks to address toxic chemicals in the environment right now, namely the Toxic Substances Control Act? PL: Well, basically, the current regulatory framework is nonexistent. So back in 1976, we passed TSCA [the Toxic Substances Control Act], which at the time was thought to be great legislation. The chemical industry opposed it bitterly, but then they managed to gut it after it was passed. In the nearly 40 years that TSCA has existed, it’s succeeded in getting a total of five chemicals off the market. And in that time, 20,000 to 25,000 new chemicals have come on the market, so it’s clearly legislation that’s not working. As I’m sure you’re aware, there are efforts in the Congress now to come up with TSCA reform, called the Safe Chemicals Act. AK: Your work as a practicing clinician and as a researcher have had great effects on policy. What do you see as the best way that doctors can serve as advocates for policy change, and what do you see as the limits of that advocacy work? PL: Well, first of all, if doctors and scientists in general are going to be effective advocates, they have to be good scientists. There are people who can be grassroots advocates, who work at the community level, who do marvelous work, who are not scientists and don’t pretend to be, and they have a very important role. But when a doctor or scientist wants to become an advocate, they have to remember first and foremost that they’re a scientist: They have to stick to their data. They have to distinguish very clearly between what’s fact and what they would like to see happen, but be based in facts. And if a person is careful and thoughtful, they can do that. It’s also important, probably like almost anything else in life, to be strategic. You have to pick your battles. You have to do [advocacy] at the right time. But I’ve always thought that when a doctor—and especially a pediatrician—learns the tools of what I call evidence-based or science-based advocacy, that that person can be extremely effective. Doctors are still respected in American society, pediatricians in particular. And when a doctor gets up and says something like, “Lead is a problem,” the way Mona Hanna-Attisha did in Flint, people listen. She did something that not everybody will do, and that’s that she took the next step and went public. Ava KofmanTwitterAva Kofman is a journalist and researcher based in Brooklyn.